For articles, tips, hints, tools, videos and much more relating to Mobile Phones, and the mobile phone industry. . . Here the idea is to tell you something about the history of Tim Austin - travels, likes, dislikes, adventures, skills and interests - maybe some of what you see or read here can be identified with and bring common experiences together. 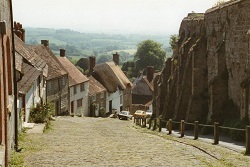 Born of English parents, in Shaftesbury, Dorset, in February 1965, many early travels and experiences cannot be personally remembered - but the journeys have been explained and passed down. 1967 was a year, of many, where Australia saw immigrants from the UK pay £10.00p for a journey and immigration - a scheme which was highly promoted. So, can we put that £10.00p into some perspective ? How much is £10.00p from 1967 worth in today's money ? Considering inflation £10.00p in 1967 is equivalent to approximately £176.29p in the year 2018. Departing from Southampton in April 1967 on the Motor Vessel Castel Felice, our ship sailed through the Mediterranean, through the Suez Canal - stopping briefly at Port Said and Aden before heading across the Indian Ocean. After an overnight stay in Fremantle near Perth in Western Australia, we sailed on to Adelaide in South Australia, and then on to disembark in Melbourne - the end of, in all, a 31 day journey. Ultimately the goal was for my father to get work as a Lighthouse keeper in Australia - after having been trained and served with Trinity House Lighthouse Service here in the U.k. before emigrating to Australia. After some short term jobs - the goal was achieved. Tasman Island Lighthouse, Maatsuyker Island Lighthouse, Eddystone Point Lighthouse - three such Australian lighthouse postings - maybe an interesting, and perhaps unique, setting for the upbringing of then a young son - Tim Austin. The lighthouse and travel bug was not to end there (or here). New Zealand beckoned in mid 1970. A relief lighthouse keeping position was available at Godley Head, near the South Island's Christchurch - the start of a new lighthouse keeping era. Late 1970 - Cape Reinga - the very northern tip of the North Island brought a permanent position. 1971 - was a chance to move again - this time to Center Island - pretty much at the opposite end of New Zealand - just off the bottom of the South Island - in Foveaux Strait - the sea which separates the South Island from New Zealand's third island - Stewart Island. Not to stay in one place for too long - late 1972 saw a return to the North Island - East Cape Lighthouse - approximately half way up the North Island on the East side. Although the Lighthouse Services in Australia and New Zealand are separate entities, bridges were never burned - Australia beckoned once again. June 1973 saw a lighthouse keeper position rise at Cape Leeuwin, Western Australia - until July 1974. Automation was beginning to take hold - the time had come for new career pastures. The following years saw another return to New Zealand - but not living on lighthouses. After living on lighthouses for a number of years, doing some schooling via correspondence - a young Tim Austin growing up - long-term mainstream schooling was a relatively unusual experience - and took some getting used to. 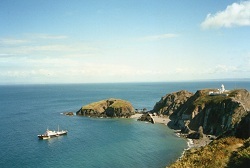 Lundy Island, Bristol Channel, EnglandAfter leaving school with New Zealand's School Certificate, and University Entrance, the then teenaged Tim Austin got an apprenticeship with the Southland Harbour Board (now South Port) as an electrical apprentice - maintaining harbour navigation systems, cargo handling systems, and general electrical installations. Pending privatisation of the Southland Harbour Board near the end of the apprenticeship saw Tim Austin with a major decision - find work locally - or at least in New Zealand - or alternatively "return" to the United Kingdom to visit barely known relatives - having left the U.K at 2 years old - memories of uncles, aunts, cousins and grandparents were non-existent (sorry Uncle Brian). Tim Austin chose the latter - a one way ticket was bought to the U.K.
March 7th, 1988 - Heathrow Airport. If the visit "lasted" a year - visiting relations, maybe getting a small job to help finance further explorations in the U.K - Tim Austin would have been happy. Nearly 30 years on - Tim Austin is still here - working as a Machine Tool Maintenance Engineer - and web site designer. Although perhaps a little sparse at the moment - over the next few days, weeks and months more travels related content will be added - in the meantime - here at TimAustin.co.uk - is the story of Tim Austin - welcome, please enjoy - if you read something which perhaps touches on your own travels and experiences - please feel free to get in touch. You can see a small sample of the Joomla! Resources that Tim uses in the Web Links page - there are other components that Tim works with in addition to those listed.